NethServer 7.5 RC1. (Updated from 7.4). The samba server was working all right but it doesn’t work it said there is an error SSSD1 But I can’t catch the screen. I reboot the server, restarts the process but it keeps not working. Could not connect to accounts provider!!! Sep 01 16:03:48 nsdc-nethserver.ad.info2.unicentrobogota.com systemd-journal: Runtime journal is using 8.0M (max allowed 1.1G, trying to leave 1.7G free of 11.6G available → current limit 1.1G). Sep 01 16:03:48 nsdc-nethserver.ad.info2.unicentrobogota.com systemd-journal: Permanent journal is using 8.0M (max allowed 4.0G, trying to leave 4.0G free of 1.7T available → current limit 4.0G). Sep 01 16:03:48 nsdc-nethserver.ad.info2.unicentrobogota.com systemd-journal: Time spent on flushing to /var is 1.433ms for 2 entries. Sep 01 16:03:48 nsdc-nethserver.ad.info2.unicentrobogota.com systemd: Started Flush Journal to Persistent Storage. Sep 01 16:03:48 nsdc-nethserver.ad.info2.unicentrobogota.com systemd: Started Create Volatile Files and Directories. The journal is really long and appears truncated! The service is running, but can’t authenticate. Under some conditions related to upstream updates the kerberos-sec and kpasswd5 are missing and authentication stops working. Please check your. Can you see the accounts list under “Users and groups” page? ->¿Do i prepare myself to format? @davidep Thanks for your time man. Can’t make ping, Yum can’t resolve hosts… this machine doesn’t seems to be OK.
Misterious traffic I think this machine is hijacked. I just upgrade the system from 7.4 to 7.5rc. @hector Do you think the problem is solved? Is a reboot required? Do you think the problem is solved? Is a reboot required? 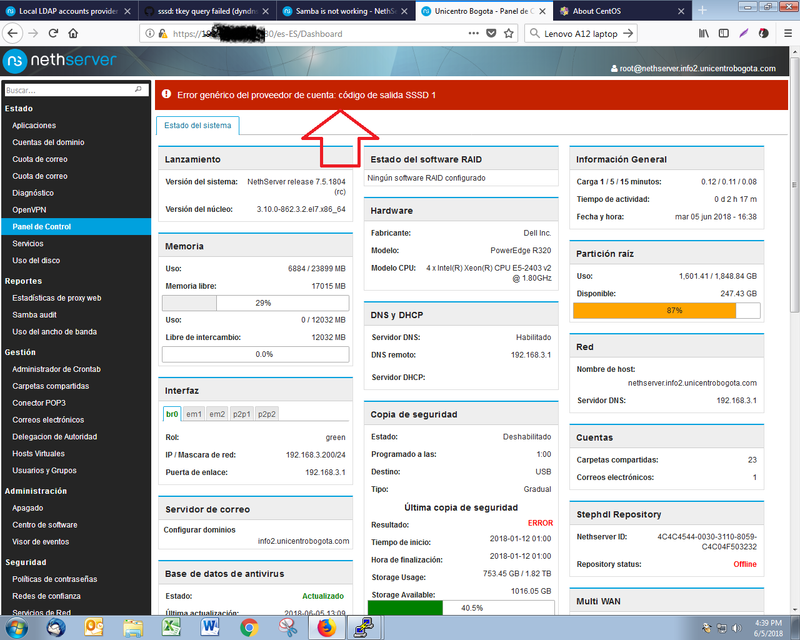 No I couldn’t solve the problem, DNS querys are not working I’m planning to format the machine, Until 20 days I can’t touch the machine for that pourpose (web aplication working). I have Ntop misterious Traffic in the machine I think that it is hijacked, dont know what to do. (I can’t Access DNS servers, neither repos).